My Good Friday and Black Saturday has been very busy. Penitensya talaga. Deadline overload but then again, rice overload. I did my marketing and grocery thingy last Thursday and planned for what to cook for the long weekend. My break and de-stressing is cooking, as always, and my God… I ate like a hungry construction worker. Sampol na lang… the night before yesterday, I prayed for the neighbors to go out of town so that I can cook the smelly tuyo. How can one eat so little with this much-loved Filipino comfort food? Anyway, below isn’t one of the dishes I cooked for the last 2 days. 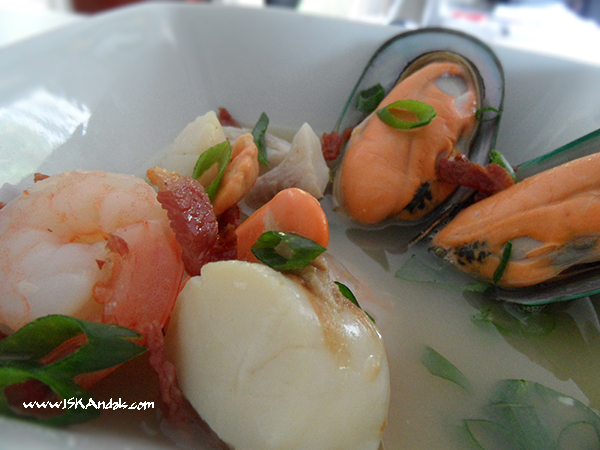 This was dinner a week or so ago but apt for those who love seafood during the Holy Week. The recipe is adapted from MKR’s former beauty queens Lisa and Candice. They maybe eliminated early (and they’re NOT my favorite) but this entrée is delightfully delicious not to mention easy to do. 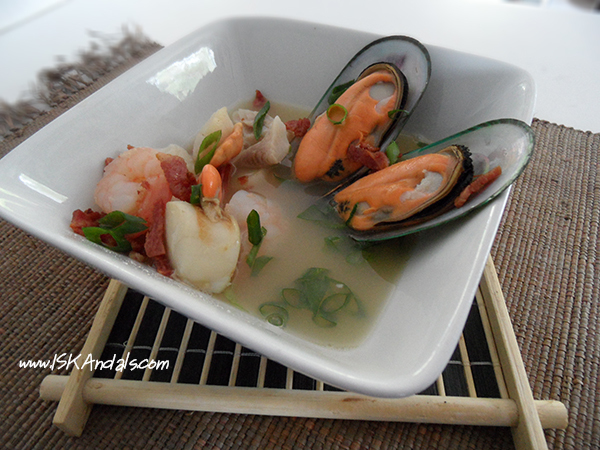 Seafood casserole of prawns, mussels, fish and melt-in-your mouth scallops garnished with spring onion and crispy bacon bits. I made a few changes on their recipe which you can find here. Start by making the chicken stock. Place chicken carcasses in a pot with water. Bring to boil and skim. Add bay leaves, carrot, onion, stalks of spring onion, and peppercorns. Bring to boil then simmer for about 3 hours, adding water when necessary. Add a bit of salt hallway through the cooking process. When done, pass stock through a sieve and discard bones and all other bits. Set aside to cool, then refrigerate overnight. When ready, scoop out the gelled fat from the broth to discard. Place pot of stock on the stove and bring to boil. Season only with a bit of salt as seafood, especially the mussels, have natural salt already. Meanwhile, fry chopped bacon on a pan until browned. Fry until crispy if desired. Set aside. Add mussels and fish to simmering stock and cook for 1 minute. Add prawns and cook for another minute. Lastly, add the scallops and cook for a minute. Remove from heat right away. 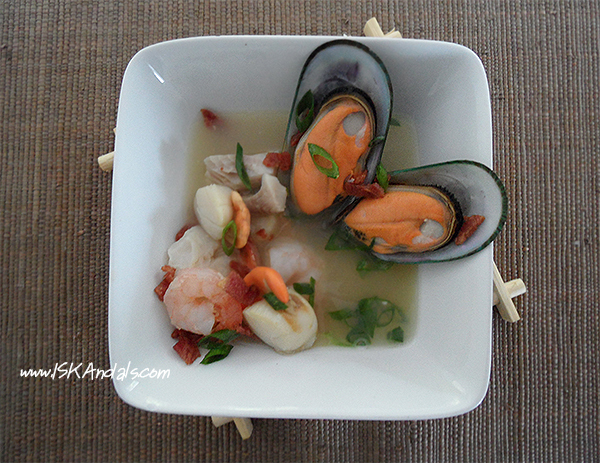 Arrange seafood with soup on individual bowls. Grind pepper over each serving and garnish with spring onion and bacon bits. Chicken stock cooked for 3 hours and 15 minutes. 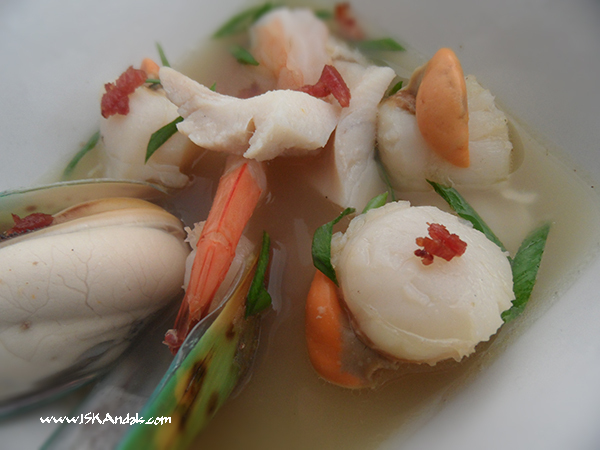 Cooking seafood with the prepared stock - 15 minutes. Lovely shots! Your photos made me wanna grab them right from the monitor! Looks so yummy! what an interesting combo! i never would have thought of adding bacon, but then bacon does make any food taste more delicious! yes, a bacon fan here.